Click here to order contacts from the the comfort of your home! Your Optometrist in Berea, KY. Call us at 859-986-7027 today. The doctors and staff at King’s Eye Care are pleased to welcome you to our practice. Our commitment is not just in meeting your expectations, but in exceeding them! We strive to provide an environment that is comfortable and friendly by using our expertise and state of the art equipment. We are located centrally in Berea, Kentucky providing eye care for thirty five years. Our services include exams for glasses and contact lenses including astigmatism and bifocal lenses. We also specialize in diagnosing and managing eye diseases such as dry eyes, glaucoma, cataracts, eye infections, ocular allergies and emergency situations. Our goal is to serve our patients by helping them with their personal eye health and providing them with professional and state-of-the-art technology. We believe that healthy eyesight is vital to a high quality of life - both of which we are committed to! Please give us a call to schedule an appointment at (859) 986-7027 or (800) 347-2318. Welcome to King's Eye Care in Berea, Kentucky. The King's Eye Care team strives to provide the finest in optometric services. We invite you to browse our website to learn more about our optometry services, and invite you to join our patient family by scheduling an eye exam appointment at our Berea office. King's Eye Care is a full service eye and vision care provider and will take both eye emergencies as well as scheduled appointments. Patients throughout the Berea area come to King's Eye Care because they know they will receive the personal attention and professional care that is our foundation. Dr. King and our team are dedicated to keeping our patients comfortable and well-informed at all times. At King's Eye Care, we will explain every exam and procedure and answer all of our patient's questions. Additionally, at King's Eye Care, we offer vision financing options and will work with vision insurance providers to ensure good eye health and vision care for all of our patients. 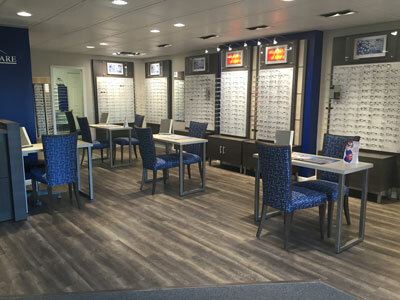 Our one-on-one approach to optometry makes Dr. King and the King's Eye Care staff the eye and vision care providers of choice in the Berea area. Our Berea optometrist offers the following services: complete eye exams, contact lenses, glasses, glaucoma testing, and pre- and post-operative care. For a complete list of services, visit our services page or call our Berea office at 859-986-7027. Buy One Pair of Glasses and Receive the Second Pair Half Off!! Dr. Gary E. King attended Kansas State University and earned his Doctor of Optometry at Illinois College of Optometry in Chicago, Illinois. He is a member of the American Optometric Association, Kentucky Optometric Association and Kentucky Beef Cattle Association. For thirty five years, Dr. Gary King has brought his patients personal, one on one eye care to Berea, Kentucky and surrounding communities. In his free time he enjoys cattle farming, gardening and traveling. Sarah is a native of Berea, KY receiving her bachelor's degree in Biology and minor in Chemistry from Eastern Kentucky University. She then went to obtain her doctor of optometry degree from NOVA Southeastern University in Fort Lauderdale, FL with speciality training in glaucoma, contact lenses and pediatrics. Upheld Vice President position of NOVA's Optometric Practice Management Association 2010-2011, member of the American Optometric Association and the Kentucky Optometric Association. r. Skidmore is originally from Upstate New York, having lived in central Kentucky for the last 5 years. He attended SUNY Geneseo and obtained a Bachelors degree in Mathematics. In 2012 Dr. Skidmore graduated from The Ohio State University College of Optometry with honors as a member of the Beta Sigma Kappa Honor Society. After graduation, Dr. Skidmore completed an Ocular Pathology Residency at the Columbus/Chillicothe VA Hospital. In his spare time, Dr. Skidmore enjoys rooting for the OSU Buckeyes, Jeep Wranglers, and is a Homebrewer. "Dr. King is great. He's friendly and he takes the time to explain things to you. There is a good selection of frames and the staff are always happy to help if you break them. It is also very affordable for people who don't have insurance."